I was talking with a friend this morning. He lives in a really nice retirement community and they have a security patrol that drives the streets 24/7. He says one of the problems is they drive a small pickup truck that gets about 15 miles per gallon and is noisy. Anybody up to no good would hear the security patrol coming and quickly hide. He thinks a Night Hawk Electric Utility Vehicle would be a great replacement – Quiet and far less expensive to operate. We really hadn’t thought about using Night Hawks for security patrol but on further reflection, it’s not a bad idea. Just think. A bad guy gets surprised by the quiet UTV and takes off running. Wherever he goes, the Night Hawk can follow. It is not limited to the flat smooth surfaces the truck requires. And since it accelerates from zero to full speed in 3 seconds, it is quick enough that the bad guy wouldn’t easily get away. Worried about the top speed of the Night Hawk EV? Well at 21 mph for the 16:1 ratio version and 26 mph for the 12:1 ratio unit, no bad guy will out run it either. As a point of reference, Usain Bolt won the last Olympic 100 meter race earning him the title of “Fastest Man Alive.” How fast did he run? 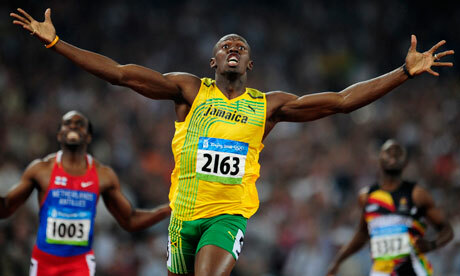 At Beijing in 2008, he ran 9.69 seconds for the 100 meters, the World Record at the time. That’s 23.08 miles per hour. So, technically, if your bad guy was Usain Bolt, he might outrun the 16:1 Night Hawk for a couple hundred yards. The world record for the 400 meters is a shade over 20 mph but far under 21 mph so your bad guy better find shelter in a quarter mile or, even if he holds the record, he’s toast. Add Security Patrol to the very long list of uses that fit the “Utility” of the Stealth Night Hawk Electric Utility Vehicle. This entry was posted in Uncategorized and tagged Beijing, Electric Vehicle, EUV, EV, Night Hawk, Olympics, security Patrol, Stealth 4x4, Usain Bolt, Utility Vehicle, UTV, world record. Bookmark the permalink.